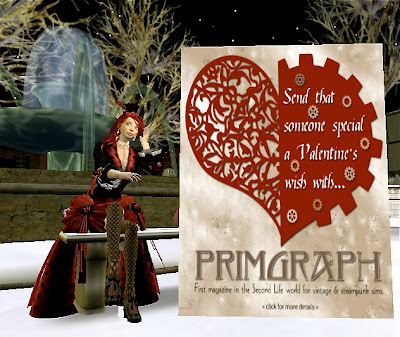 That you proclaim your most heartfelt feelings in the premier Victorian & Steamlands publication on the Second Life grid! "Valentine's Day is coming ... Do you want to shout your love from the rooftops? Do you want to share a secret? 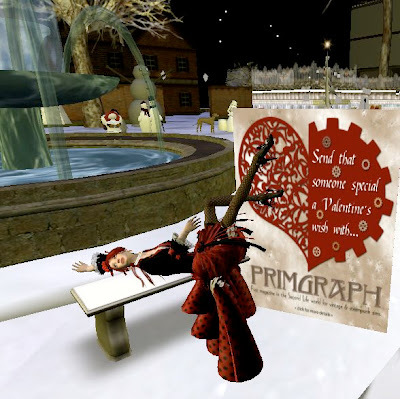 You can do both with the special Valentine's feature in The Primgraph! 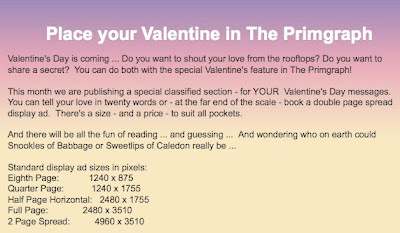 This month we will be publishing a special classified section - for YOUR Valentine's Day messages. You can tell your love in twenty words or - at the far end of the scale - book a double page spread. There's a size - and a price - to suit all pockets. And there will be all the fun of reading ... and guessing ... And wondering who on earth could Snookie of Babbage or Sweetlips of Caledon really be." The deadline for ordering your Valentine Classified Ad is January 31, 2010. For display ads or questions please email 'elegia dot underwood at gmail dot com' NO LATER THAN 31 JAN or contact Elegia Underwood in world. Capt. Red is sitting in her garden dreaming about Steamy Valentines..... wearing the To a T Ladybird Domino gown ensemble that includes, 2 different kind of bustles, stockings, & hat. Also wearing the uber cute Uber Curliecue Cutea Grimm Bros shoes!